Each Acid Loop Pack gives you countless compositions and hours of fun. Included in each Acid loop pack are : Drums, Synths, Percussions, Sound FX, Vocals, Leads, One Shots, Guitars, Rhodes, Bass, Snares, Rhythm Enhancers, Scratch Beats, Kicks, High Hats, Cymbals & More. 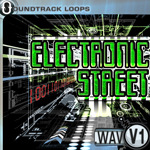 For Only $ 12.00 USD you get over 100+ loops of .wav Acid loops files they are a great purchase for any producers. Add them to your favorite program such as Acid, Cubase, Logic, Pro Tools, Soundtrack Pro, Ableton Live, Traktor DJ, Reason, Torq or any other music creation software. All Loops are 16bit 44.1kHz Stereo files & Royalty Free. Each Loop Pack Includes 100+ MB in Acid Loops .wav over a hundred individual Downtempo, trip hop, ambient, urban & hip-hop Acid loops.